At Jarrow we believe in adding a few well selected “specials” classes, where we bring in well trained and experienced teachers to enrich the already rich Montessori curriculum. These subjects are interwoven into the curriculum for all grades, with the exception of Spanish for the Toddler program. All classes are taught by teachers who are experts in their specialized field. Art is a place in the curriculum where students simultaneously use hands, heart, eyes and mind. The art program seeks ultimately to heighten visual perception. The program focuses on providing guidance that encourages creativity, critical thinking skills, self-expression, and mastery of techniques, building a foundation on which to grow. 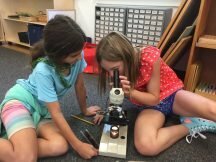 Students are encouraged to observe the world around them while weaving the studio experiences in and around classrooms curriculum and focus/theme. The curriculum will be used as a springboard for creating visual statements while introducing different mediums/materials, investigating other periods and cultures, and reinforcing art elements and principles. Children are encouraged to express themselves through the manipulation of various mediums such as clay, charcoal, acrylics, watercolor, and pastels. The Physical Education and Movement Program at Jarrow provides children with the opportunity to experience total involvement. This requires that the child use his/her body, mind, emotions and imagination with enthusiasm. We encourage children in this class not only to learn a specific activity but also to grow as individuals and use their entire personality in order to move with understanding and control, in large groups or by themselves. Children at Jarrow —whether they are in Toddler, Primary or Elementary programs— learn about the variety of creative and efficient movements which the human body is capable of producing. This is aided by the use of many different types of movement, materials, and apparatus. The goals at Jarrow for children in P.E. and Movement are to help children understand the importance of teamwork, sportsmanship, safety, proper technique and most importantly to have fun when engaged in an athletic activity. The Music Program at Jarrow centers on empowering all children to be musicians. Becoming fluent in the language of music gives a person a way to understand people of other cultures and other times. It also provides a sense of unity, history, and self-expression that lasts a lifetime. Music affords a medium for student learning successes, empowerment, and creativity. Rhythmic movement plays a large part in the internalization of music and math skills; as students get older they learn increasingly sophisticated movements and dance. Additionally, students learn to sing with proper technique, to read music notation, and to play instruments. Listening skills develop as children learn to describe what they hear with increasingly descriptive language. The Spanish language program at Jarrow is designed to stimulate your child’s natural interest in language, culture, and communication. A multi-sensory teaching approach is used in order to appeal to a variety of learning styles. Children learn Spanish through the use of instruments, movement, songs, games, puppets, models, pictures, visuals, flashcards, manipulative and Spanish books. At the Primary level, students learn basic commands, colors, shapes, animals, songs, and numbers. The Junior and Senior Elementary classes learn how to answer basic questions, count into the thousands, tell time, use formal commands, express emotion, and comment on the weather. They also develop a foundation of verbs, nouns, and adjectives. Each month a different unit is covered such as the classroom, the school, town, state, country, world, universe etc. Additionally, the Upper Elementary class maintains a Spanish notebook of vocabulary and grammar lessons covered in class. Both classes are taught predominantly in Spanish. The awareness children begin to develop through the acquisition of a foreign language reinforces the Montessori’s goal of “education for peace.” This idea of “education for peace” is central to the mission of Jarrow’s Spanish Program. It creates a foundation for children to become engaged, culturally aware individuals in an increasingly interdependent world. 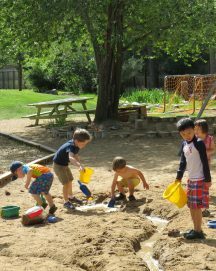 “There must be provision for the child to have contact with nature, to understand and appreciate the order, harmony, and the beauty of nature.” Dr Maria Montessori had deep reference for the natural world in her Cosmic Education curriculum and felt that the outdoor environment should be an extension of the classroom. 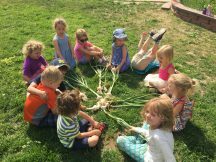 Jarrow Montessori’s Outdoor Education program offers students a meaningful, hands-on, learning experience with the life, and ecology of the natural world. 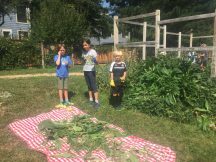 Primary through elementary students plant, tend to, and harvest from the school’s indoor Aquaponic system, outdoor annual vegetable gardens, herb gardens, and edible and medicinal perennial gardens. 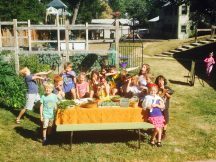 In our outdoor learning environments, students are able to extend the Montessori curriculum to a direct sensorial experience with nature and their role as “stewards of the earth.” As students deepen their connection with animals, plants, natural cycles and forces, they are able to better understand themselves, our impacts as humans, and the interconnection between all things. Jarrow offers a variety of after-school enrichment classes for Primary and Elementary children (ages 3-12) at 3:30 pm. We offer three eight-week sessions throughout our school year. Offerings include Science, Chess, Art, Music, Dance, Sports, Yoga, and much more! Click here to view our 2018/19 Enrichment Catalog!